Raccoons Rags: Fabulous February: 10% off all items in my Etsy shop. Fabulous February: 10% off all items in my Etsy shop. A quickie post, but one that I hope you'll like. 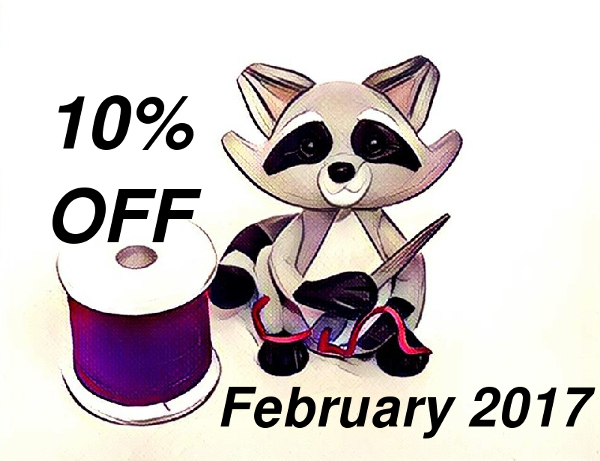 February is a bit of a quiet month for me, so to encourage people to get their patterns in early, I'm offering a 10% off coupon code for this month. And as this has started slightly late - Feb 3rd - the coupon will last until March 3rd to make things a bit more fair. In other news, I've resorted to the jolly old credit card to buy another Kaye Wiggs doll. This one is Lilac Layla - whom I understand is very rare. She's coming from France, so no Customs charges to pay. Woo-hoo. I can't wait. She has the sweetest face and I just fell in love. And of course patterns for the MSD (45cm) body. Once I can afford a Tobi body, that will make my KW world complete - and will result in more patterns. But that will only be after I've paid off the credit card. Maybe November, if business is good. I'm looking forward to photographing her. I winder what the lilac resin looks like in real life. It seems very pretty in the photos. Excuse my ignorance, but.. KAL? KAL = Knit A Long... we all do the same pattern over the course of a month .... It's an interesting sideways construction.... at least going sideways I'll be able to try it for size as I go along!!! Lilac resin sounds pretty... but then you know me and my liking for all things purple!! I keep looking at the KW dolls... still not caved - haven't bought a doll since last August!!!! That sounds fun! I've made sideways sweaters for people in the past, but haven't been brave enough to try it on dolls yet! I'd love to see the finished article.